On Wednesday night, September 5th, for the first time in my life, I was awed by a list of . . . ground rules. I am convinced that my reaction is based on factors that go beyond the individuals who gathered that night. I believe that these factors are significant for those of us who work with learning communities of all kinds. The list begins by reflecting the ordinary unfolding of ideas. Starting on the left side and working down: “be respectful,” “no judgement (sic),” and “[be] open-minded” get the ball rolling. Then a transition takes place: “be willing,” and “be supportive” open not just minds but souls to say “be yourself” and “believe in yourself/others.” WOW! The rest of the list is a bit of a let down. In fact, it is a pullback. After the height of the bottom of the left column, the room fell silent. In the lull, I suggested “cellphones off.” From that mundane place, the rest of list is no surprise. In case you were wondering, “WHHHS” stands for “what happens here, stays here.” The final two are a bit defensive. The moment had passed. So how did a group of college students in their first formal session get to that heavenly place filled with so much soul? These factors all contribute to one fundamental element: culture. Legacy A pilot is an experiment. A sequel is an extension. A series is the accumulation of adaptations (hopefully improvements). The sum total, though, is a refined vision and mission. Newcomers, like the students who generated the above list of ground rules, enter a space that is defined by the legacy of those who came before and the work that was done before; they enter a culture. Expectations If the legacy of predecessors yields a refined vision and mission, the culture translates that definition into expectations. Newcomers sense more quickly what is expected of them. Goals are more clearly articulated and bounded. The experience of previous participants focuses entrants on meeting or exceeding expectations in order to perpetuate and grow the established culture. Depth Established cultures do not automatically create a space for the soul to appear. Depth of personal interaction and meaning, however, infuses an expectation of trust and daring within the culture. The soul is compelled to speak when depth is a priority in the culture. Heritage In an established culture of depth, participants are bearers of wisdom. Their successors bring that wisdom (or some of it) to the table, if the successors have been recruited. This recruitment may look like a pipeline or a bequest. The key is for the outgoing group to hand-off the culture to the incoming group. This induction into a tradition is the heritage of the culture. Enterprise If the heritage is merely reenacted, the culture will become stale. A spirit of enterprise keeps the culture active: breathes life into the legacy; attempts to exceed expectations; delves deeper; and imbues the heritage with daring. Most important, enterprise charges newcomers to have ownership of the culture. 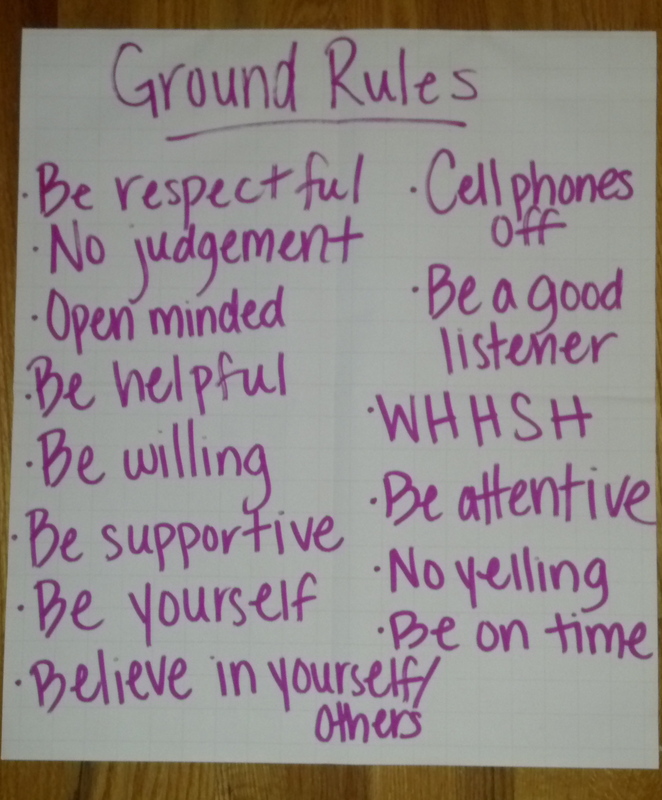 The group that generated these heavenly ground rules is part of a culture. The college students in it were inducted earlier that night as the fifth cohort of Campus Entrepreneur Initiative (CEI) and MASA interns at the University of Delaware Kristol Hillel Center. These interns are charged with “building relationships” and “connecting to Jewish life.” They do so through meaningful conversations, individual experimentation, and community creation. The net result of four years of the program is precisely the culture of legacy, expectations, depth, heritage, and enterprise. Ground rules are meant to be ground-level, the mundane of the mundane. They are meant to set a minimal bar upon which to build. A learning community, like CEI/MASA, can and will set the bar higher once the culture is established to move to higher ground. I never imagined it might reach the a place where the soul resides. Now that the sky is no longer the limit, I aspire for all learning communities to build the community that allows us to reach the heavens. Let me know if you have found success creating a culture for a learning community to begin with soul. Do you have similar or different factors feeding that culture? Let us pay attention to where we go with piloted experiments once they become established. Can we plan for culture? Share. Perhaps we can create that culture here, one step at a time.